I'm having way too much fun thinking up and testing recipes for this Saucy Mama contest! This one is a light salad made up of shrimp, watercress, pineapple, avocado and the delicious Pacific Rim Ginger Dressing from Saucy Mama. There is the peppery watercress, sweet pineapple, creamy avocado, all tied together perfectly with the warm Ginger Dressing and its delicious flavors of ginger, lime, cilantro and garlic. Let me know if you try it! Make sure to check out Saucy Mama's Facebook page for more great recipes and photos, and enter our GIVEAWAY (details below)! 1. Combine watercress, pineapple and avocado in a large bowl. 2. In a small pan, heat olive oil over medium heat. Add shrimp and let cook until pink on both sides. Season shrimp with black pepper. 3. Add Pacific Rim Ginger Dressing to pan, and reduce heat to low. Let cook for 2 minutes, stirring occasionally. 4. 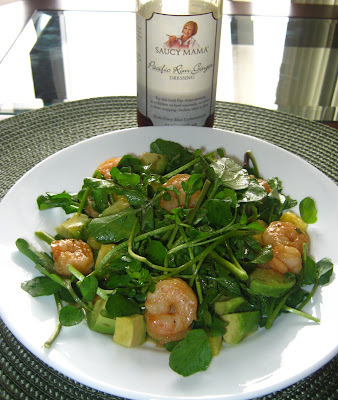 Drizzle shrimp and Ginger Dressing over salad. Serve immediately. Serves 2. Remember you can enter to win a fabulous prize pack from Saucy Mama! 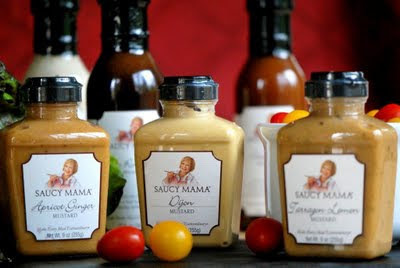 Saucy Mama is generously giving away a prize pack to one of my readers, containing one bottle each of their Sweet Heat Marinade, Tarragon Lemon Mustard, and Pacific Rim Ginger Dressing. Winner will be selected randomly. Prize will be shipped to U.S. addresses only. Winner will be announced on CurlyKMommy blog on May 23, 2011. Thanks Carole! I will check out your blog too!